Continuing manufacturing excellence, Sinto America recently manufactured and shipped two KSB Spinner Hangers with open loop conveyances for aluminum die-casting to an automotive manufacturer. See Sinto’s KSB Spinner Hangers: https://sintoamerica.com/product/ksb/. These KSB spinner hangers are able to process 800,000 parts annually. The systems were delivered to an Automotive Tier 1 Supplier in the Midwest and installed in December of 2018. Sinto’s spinner hangers can easily handle heavy parts, products up to 5 ton can be processed. 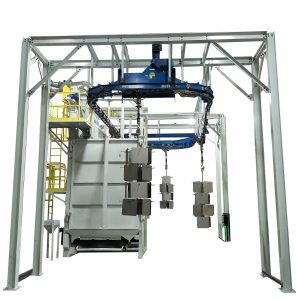 These machines are an excellent choice for processing a high number of parts where parts cannot touch during the blast cycle. For more information, visit https://sintoamerica.com/sinto-surface-treatment/. We have long strived to be the leader in the design and manufacture for all surface treatment, metal finishing and shot blasting applications. From standard to custom, simple or complex, or a single piece of equipment to a full system, that’s the Sinto difference. Your one stop solution. Sinto Surface Treatment is a division of Roberts Sinto Corporation. Roberts Sinto Corporation is a part of Sinto America, Inc., the North American group holding company, of Sintokogio, Ltd., Japan. The Sinto group of companies has an international reputation for excellence in the foundry, manufacturing and surface treatment industry. With over 80 years of experience providing state of the art systems to industries worldwide, Sinto Surface Treatment is well positioned to provide the optimum solution to your finishing challenges, offering a complete, comprehensive line of surface treatment blast machines to fit any application. Sinto America focuses on six primary markets- Foundry, Sand Processing, Bulk Material Handling, Automation, Surface Technologies and Surface Treatment. Sinto also provides contract blasting and precision shot peening services through our National Peening and Technical Metal Finishing divisions. Learn more at www.sintoamerica.com.